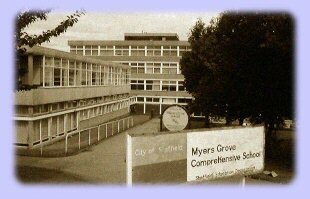 Myers Grove School was a mixed non-selective local authority comprehensive school serving the area between Malin Bridge and Stannington. It was located on the edge of the countryside between the Loxley and Rivelin valleys, (see map). Sheffield City Council closed both Myers Grove and Wisewood schools and replaced the two of them with a brand new BSF-funded school on the Myers Grove site., Forge Valley School. Myers Grove was built in 1960 and the first headmaster was William Hill. It was one of the first purpose-built comprehensive schools in the country, and for a while it was the largest in the north of England. At that time, Myers Grove was the envy of most schools, both academically and in sport and other non-academic achievements. I attended Myers from 1980 to 1987. During this period Roy Yates (1978 to 1993) was head teacher and approximately 2200 pupils attended from years 1 to 5 and two years of sixth form. We lost the sixth form in 1988 when David Blunkett's city council "rationalised" it away from us. Myers Grove has a new website at www.myersgrove.sheffield.gov.uk.